The first wreath I ever made was back when I belonged to the Geneva Young Mother’s Club. A local florist came to a club meeting for a hands-on tutorial. She said she liked my wreath but I wasn’t so sure. 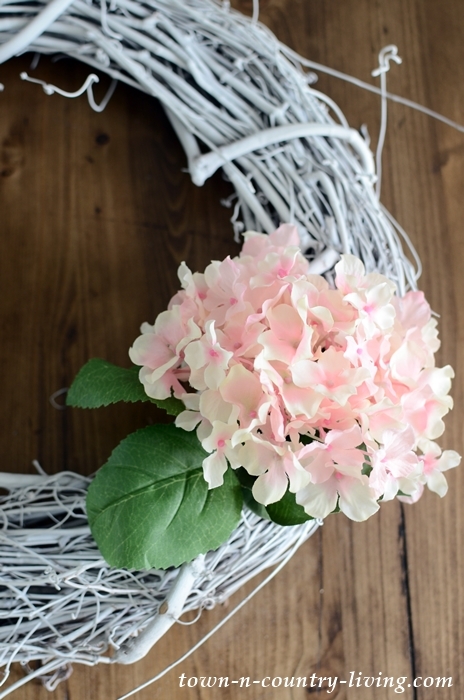 I’ve always envied people who can make pretty wreaths, and I think I finally figured out how to make an easy DIY summer floral wreath. 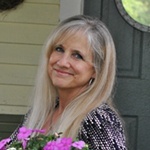 If I can do it – you can too! I promise! 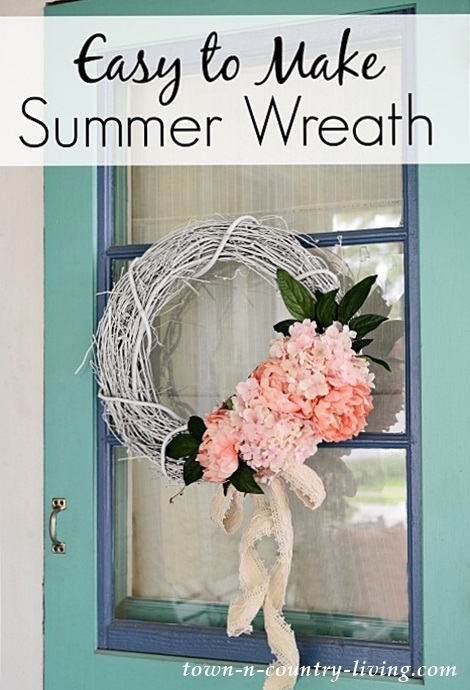 First, I’d like to give a huge THANK YOU to Krista at The Happy Housie for organizing today’s tour of summer wreaths (there are links to more DIY wreaths at the end of this post). At first I wasn’t going to participate because my wreath-making skills are, shall we say, a little lacking? But then I decided to challenge myself and create a wreath – and I’m glad I did! I wanted a white wreath form but couldn’t find one at Hobby Lobby so I grabbed a $5 grapevine wreath and a can of white spray paint. I spray-painted the wreath outside on the driveway and brought it inside after it was fully dry. You could leave your wreath natural, too. It just depends on the look you’re trying to achieve – I wanted light, airy, and a bit romantic. 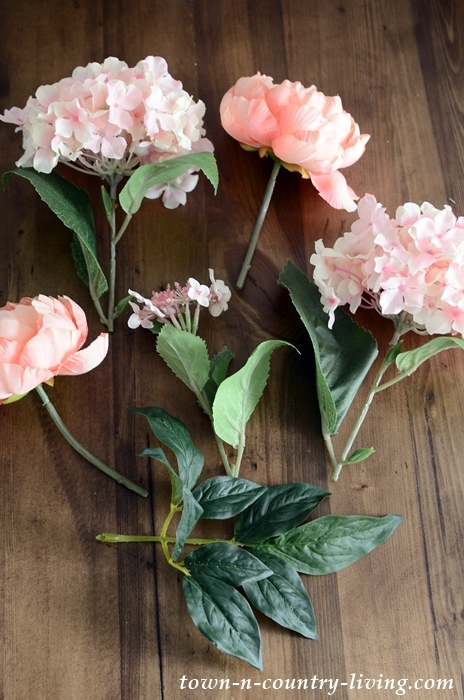 Next, you want to deconstruct your faux flowers. I chose pastel pink and orange flowers with large blooms – peonies and hydrangeas. Snip off the blooms leaving a few inches of stem. Pull the leaves off the stems and set aside. Working with one flower at a time, stick the stem of the flower into the grapevine wreath. There are lots of nooks and crannies in a grapevine wreath so this is super easy to do. If one cranny is too tight, simply choose another hole to push the stem into. Keep repeating until you’ve filled approximately one-third of the wreath. Take a few of the leaves and insert their stems into the wreath after all the flowers are placed. If any stems stick out the backside of your wreath, simply tuck them back into a nook or cranny. I didn’t have to glue any of the floral pieces into place. Score! After all your flowers and a few leaves are tucked into your grapevine wreath, it’s time to add the bow. 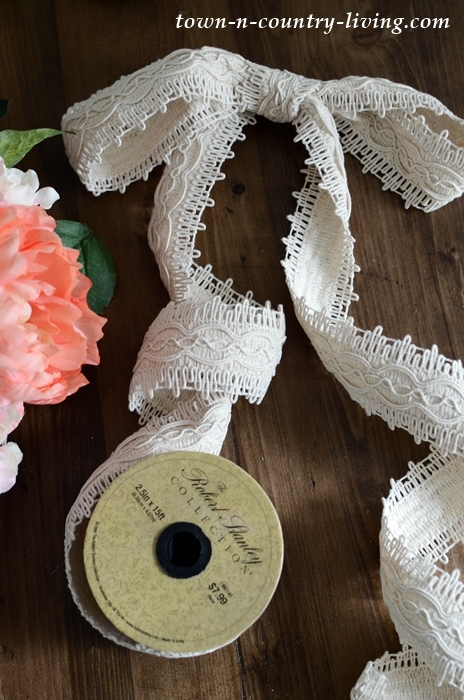 I chose a creamy textured ribbon – but really, any ribbon will do. Tie the ribbon into a bow and cut the ends of the ribbon tails on an angle. 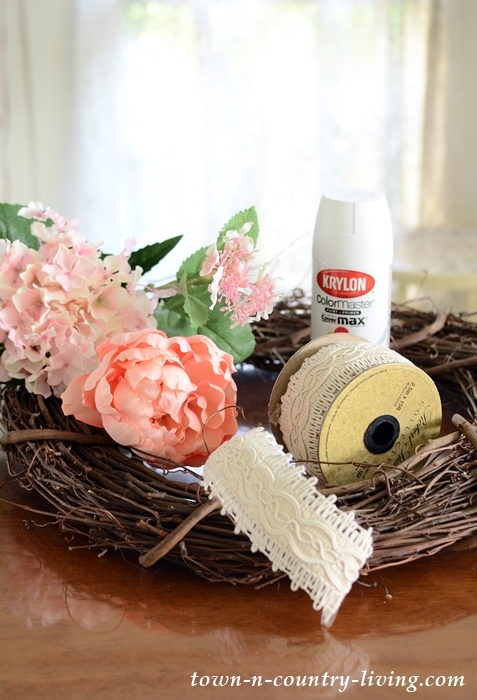 Using a hot glue gun, glue the backside of the ribbon’s knot onto the grapevine wreath. I used a pretty big dollop of glue. Press the bow onto the wreath and hold for a few seconds to make sure the ribbon is securely adhered to the wreath. If the ribbon falls off, simply re-glue with a bigger dollop of the hot stuff. I left the tails of the ribbon a little long because I wanted them to drape down the front door a bit. The beauty of a grapevine wreath is that you don’t have to add a hanger to the back of the wreath (although you can certainly add one, if you’d like). The wreath will settle firmly onto a nail or wreath hanger. 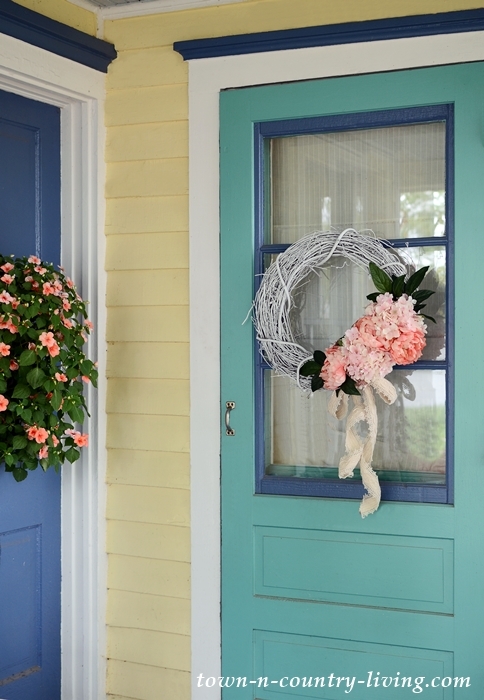 The hanging bough of impatiens on my front porch was the color inspiration for my easy DIY summer floral wreath. The impatiens will bloom prolifically all summer long and well into fall. The faux hydrangeas are a pale pink and the peonies are pale orange, mimicking the hue of the impatiens. Orange pillows continue the summer color scheme on the front porch. 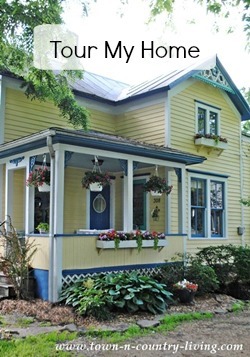 I like using orange with the yellow and blue exterior of my home. This just might be the beginning of my wreath-making journey. For the next one, I’m going to fill the wreath base with flowers all around. Be sure to check out some of the amazing wreaths at the links below. 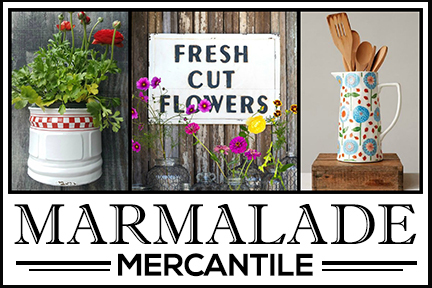 You’re sure to find one you like that you want to make for yourself (or a friend or two). Jennifer, i love the simplicity and color of your wreath. 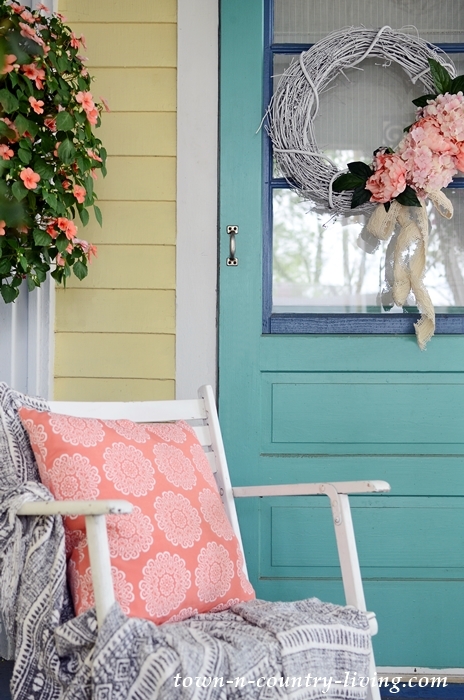 looks so pretty and coordinates so well on your porch. Thanks Nancy! It was a fun tour! 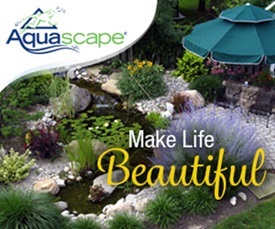 Has it been busy on your street, with everyone coming by to see your pretty front porch. Those colors are so pretty for summer with your pretty wreath and flowers. Gorgeous! 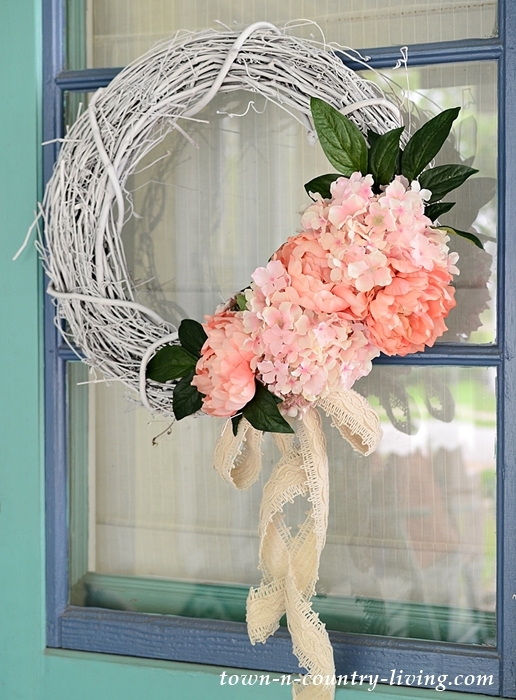 I love the pink hydrangeas with the white wreath base…it’s so soft and perfect for summer! Your wreath is beautiful! Maybe I’ll try to make one, too. . . My wreath making attempts usually fail! Thanks for the inspiration! Love how you sprayed the wreath to give it a summery affect and I love how romantic that bow looks. So pretty! I love the white wreath form, too. I have tons of dogwood growing on my 9 acres and I hate it! Do you think I could use that to make a wreath instead of grapevine? Then I could cut it down and put it to use all at the same time! So pretty, Jennifer! I absolutely LOVE the colour of those hydrangeas – and the way the whole thing matches your pillow! Too cute! So glad you could join in on this hop!